Sisters of Battle Player, Hello! I've been coming to the Hobby Bunker for a long while now. I mostly have been spectating and watching you folks play. I used to play games up at the Castle in New Hampshire but it was always a bit of a hike. I am going to try and come by more often and learn 8th ed with my girlfriend. 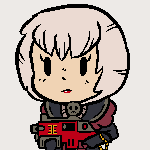 I have been playing Sisters for about 10 years now, I have a Deathwatch army that I play a lot as well. I have collected a lot of other armies over time but they sit on the backburner and just come out when I want to try something different. I recently got a Primaris army I am building up and my girlfriend is working on her Khorne Army. We are going to play small combats as we build are new armies together. I can't wait to get a chance to match up against you guys! Re: Sisters of Battle Player, Hello! Hello. Welcome! Glad you can come by. I am doing the same thing with my girlfriend, except my armies are already built and I am helping her with her harlequins. We have Thursday nights and Friday nights open to us along with our "Sacred Sundays." We are very casual, so it's very easy to watch a game and/or inquire about tips and tricks. On Tuesdays, we try to arrange an online hobby-hangout, so a few of us get together and work on models. Again, welcome and hope to see you around more. I'm working on the order of our martyred lady at the moment ..glad to see an other sisters player !